H.B. duPont Middle School Student Council takes on “Naked Book Project” – Success Won't Wait! Many thanks to the members of the Student Council of H.B. duPont Middle School, led by program facilitator Sarah Brady, for taking on the latest phase of the Success Won’t Wait Naked Book Project. The project was created by Success Won’t Wait in response to the number of books received that were yellowed, torn or otherwise unusable. The books’ covers are removed, rendering them “naked” and the paper is then recycled. Student Council members received their first delivery of books for processing. The proceeds from the paper recycling will go to H.B. duPont Middle School. 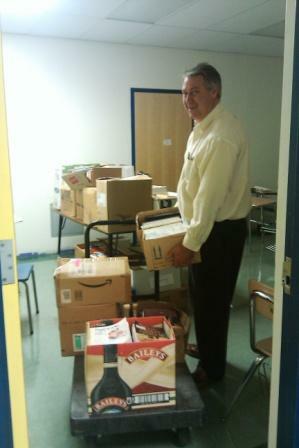 Photo: Donald McNeill delivers the first shipment of books to the Student Council office. Previous The results are in! Annual Book Drive nets over 6,000 lbs. of books! Next Santa’s elves are busy at Success Won’t Wait!